When bananas are ripe and perfect for baking with they become super sweet which in the right recipe can allow you to reduce the sugar. 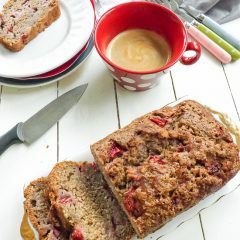 Quick breads and Muffins are perfect for doing this in, as I have done so in this strawberry banana bread. Also the strawberries that I used were super sweet and as the bread baked the strawberries on top went all jammy and extremely sweet, allowing me to reduce the sugar even more. There is only a total of 100 grams (1/2 cup) in this whole recipe. Thats only 10 grams, about 1/2 a tablespoon per slice, not bad for me.  If you would like to try your hand at a sugar free banana bread recipe, then I have the perfect one for you. But I found this one benefited from having a little sugar added to it. I don’t know why I am so crazy for baked banana goods. I eat fresh banana’s like they are going out of fashion so I always have a stock of them in the house. Occasionally the odd one does slip through the net and starts to go all speckled and a little to ripe for me to eat fresh. For some reason I like to eat my fresh banana’s a little on the green side. 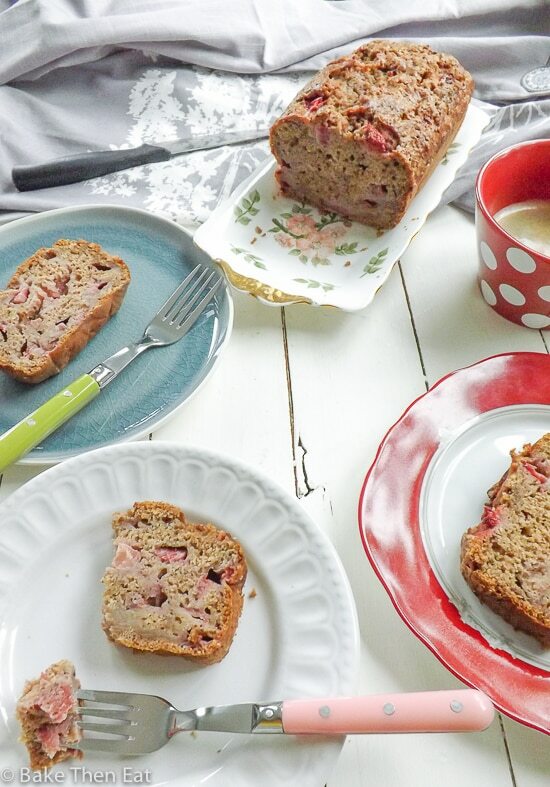 Although the speckled ones are perfect for baking loaves, breads, muffins and cakes, just like this strawberry banana bread. I think my love comes from my Nan, who always made banana cake as a treat. 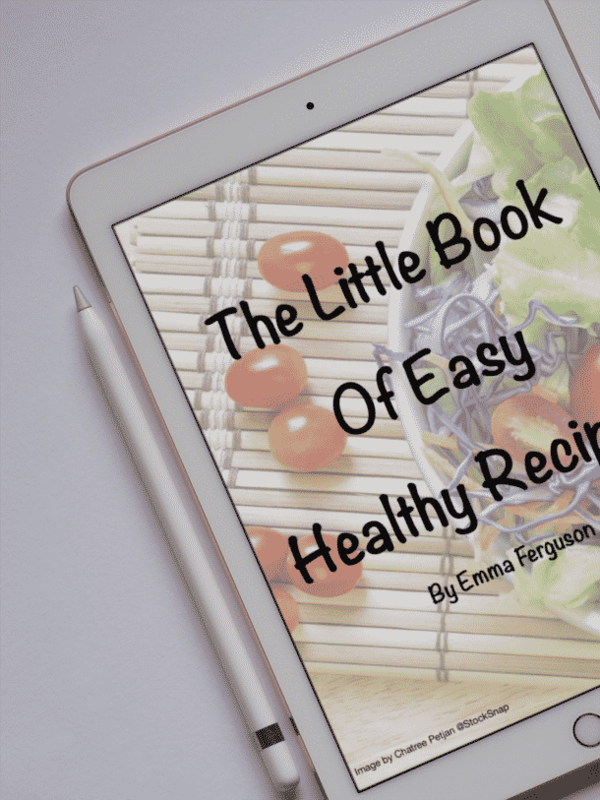 I have made her recipe and shared it a few times on this blog, you can find the most recent version here. ‘My Nan’s Banana Cake‘. So I guess we all have that one ingredient we are all slightly obsessed with. For some it’s chocolate or caramel but for me its banana’s! 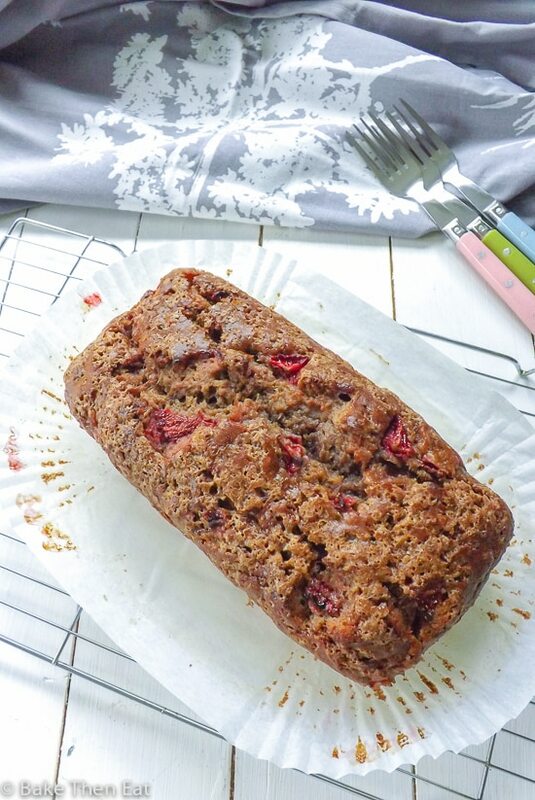 Reduced Sugar Strawberry Banana Bread is an easy loaf to make, packed full of banana and fresh strawberries adding a natural sweetness to this bread allowing for a reduction in refined sugars. Preheat your oven to 180C / 350F / Gas mark 4 and line or lightly grease a 2lb loaf tin. In a small mixing bowl mix the flour, baking powder, baking soda, salt and ground cinnamon together and place to one side. In a medium sized bowl mix the sugar, oil, eggs, vanilla, milk and mashed banana together until they are very well combined. Pour the flour mixture into the bowl of wet ingredients and with a gentle hand, fold it in. Toss the strawberries and the 1 tablespoon of flour together in the small mixing bowl that you had the flour mixture in and then gently fold them into the batter. Pour the batter into your prepared tin, flatten the top and pop it in the middle of your hot oven to bake. Check on your loaf after 45 minutes for doneness, if an inserted pick comes out clean then your bread is baked. If not give it a few more minutes. If you are worried of over browning your loaf then cover with a little tin foil. Once baked through leave to cool in the tin for 15 minutes, then transfer to a wire rack to fully cool down. This bread is best eaten within 4 -5 days, keep it in an airtight tin in a cool temperature. This loaf freezes really well, either whole or in slices. It can be frozen for up to 3 months. What a yummy combination this is, banana and strawberry. I would love to try. Thanks Shauna, I love adding even more fruit to banana breads. I will always choose fruit over chocolate! Love banana bread and it is so nice and easy to reduce the sugar when using ripe & sweet bananas. Nice treat! Its always good to reduce sugar Miriam 😀 I know I need to do it more often! Thank you, Emma, for sharing. It looks really healthy and tasty. Love the combo of bananas and strawberries. Haven’t tried the two in bread, though. Really clever idea! This looks wonderful — thanks. They work so well together 🙂 thanks John. Looks delicious, Emma! Love the banana and strawberry combo! haha I mean two weeks?! That is just too long! 😉 I love baking with banana and with the strawberries? Sounds like the perfect combo! 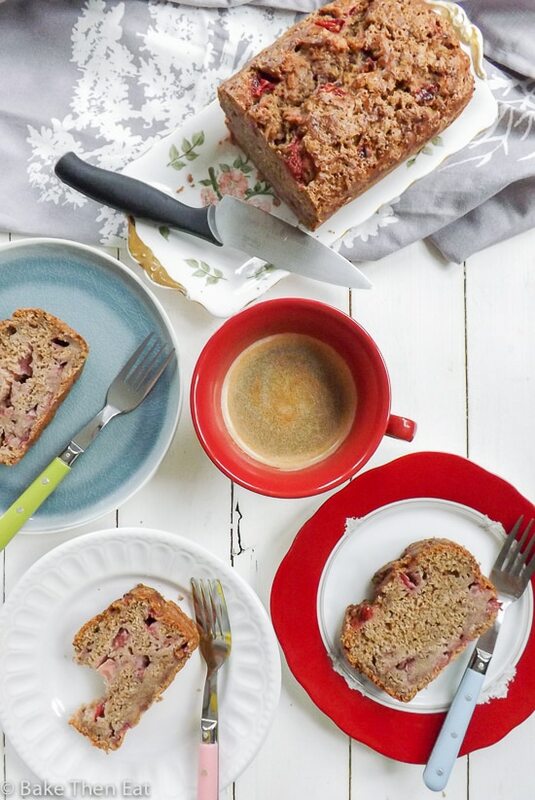 I am loving the idea of reduced sugar in this strawberry banana bread, Emma. Love how easy and so full of natural sweetness this is. I would surely try this bread sometime soon. I really like the idea of taking sugar out and putting strawberries in! Lovely colour and flavour in the banana bread. Thanks Caroline, the strawberries really do make up for the reduced sugar. love all teh fruit in here!! i really should cut down on all the sugar i’m eating so this sounds perfect (: now, if i can hide away some bananas before my family devours them all…. Hi Heather I have the same problem with banana’s, so I just buy extra to allow them to go all spotty! I always like the idea of a bit less sugar-not sugar free mind you as that can be a bit punishing but just less sugar. 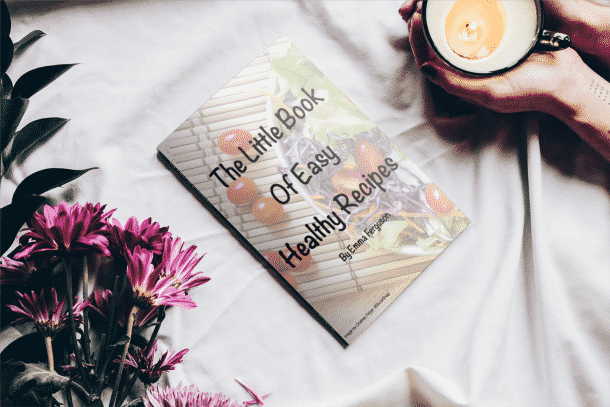 Some recipes use a lot! I completely agree Lorraine, some bakes do use a lot of sugar and reducing it can be a good thing. But when you completely omit it sometimes it just doesn’t work! WOW Emma, strawberry and banana sounds like a heavenly combination. I love banana loaf and this is a great recipe for the next time I bake a loaf. Thanks Ashika, banana and strawberry pair so well. This reminds me of my favorite juice when I was a kid. Weird to say because this is bread – but true! Tropicana Strawberry Banana! Such a good combo!!! 😀 I won’t lie though, I never liked fruit chunks in any of my food – however, I bet this would smell AMAZINNNGGGGGG!!! And a little vanilla icing on top! OMG! GiGi the smell was amazing, part of the reason I love making banana bread so much (apart from being so easy) is the smell! I’m right there with you in terms of bananas. SO GOOD! I love that you added strawberries here–I need to try this ASAP! I love bananas so much Kelsie, its almost an obsession with me. I spend my life making banana breads! ooof this looks seriously delicious! 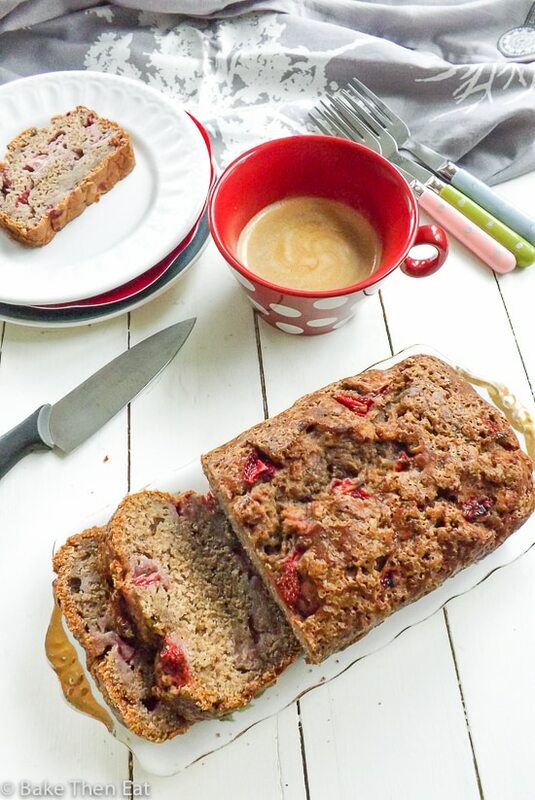 Bananas and strawberries are so good together, love this bread Emma! Thank you Cheri, I am glad I am not the only one that loves strawberries and banana together! Reduced sugar is good and I can definitely have an extra slice without feeling guilty! Thank you Angie, less sugar is always a good thing!